Chicago Gourmet, one of our favorite foodie events in Chicago, was last weekend and it was an amazing, gluttonous experience, as always. This year was especially good – since I got to go to the event with both M and my mom – which was not only fun, but helped with the strategic planning and maximized the food! This year was unseasonably warm – with temperatures pushing 95 degrees – so we knew we had to strategize especially well to keep backtracking to a minimum. This year’s Chicago Gourmet was set up similarly to previous years, with wine distributors in an aisle in the middle and themed chef tents and individual sponsors on the outside perimeter of the Pritzker Pavilion area in Millennium Park. There were 11 themed tasting pavilions this year, each featuring two rotations of 3-5 chefs. We headed to the seafood pavilion right away, always a fan favorite (and the booth with the longest line). Next up was the BBQ tent, featuring not only BBQ restaurants, but the ever-popular Stella Artois booth with its signature glasses. There was also an unusual habanero custard dessert made with dry ice on offer in the Stella Artois booth, served by none other than Top Chef contestant Katsuji Tanabe. Always on the hunt for international eats, we liked that there were two dedicated international tents this year: Thailand and Mexico. However, there were no sister cities represented, as there were last year. The Thai booth featured two rounds of Thai restaurants from the Chicago area, while the Mexico tent featured a different region on each day of the festival. Chefs from restaurants in each region were present, with Saturday featuring Guadalajara and the Yucatán on Sunday. We were pretty excited because Yucatán food is some of our favorite in Mexico. Pork Rib from Big Ed’s BBQ in Waukegan. This pork rib was perfectly smoked – it didn’t even need sauce – the true test of good BBQ. Though the sauce was good too. The portion was big, and we didn’t mind at all. Smoked salmon toast from Roanoke Restaurant (top left above). This was the first bite we had at Chicago Gourmet, and it ended up being one of our favorites. The salmon was delicate and creamy, and paired well with the crunchy chip. Cochinita pibil from Manjar Blanco Restaurant in Mérida, Yucatán (pictured above). The Mexican tent featured three chefs from Manjar Blanco restaurant, and 3 different types of pork tacos. Our favorites ended up being the flavorful cochinita pibil, spiced up with a little habanero sauce. Thai rice salad from Choun’s in Wheaton (pictured above). Though this dish was only called “rice salad” it reminded us of Nam Khao Tod, and consisted of crispy fried rice, chicken, onions, cilantro, mint and lime – all of our favorite flavors. We had never heard of this restaurant before and are looking forward to visiting them. Salted caramel brownie from Bittersweet Pastry (Pictured above). This was a perfectly executed brownie with caramel sauce, what could be better? Though we agreed on most of our favorite dishes, there were a few where we diverged. M liked the terrine from Bohemian House, and I liked the inventive tempura shrimp taco served in a crunchy taro root chip shell from Arbella. We have to say that this year, the desserts particularly stood out. Aside from our previously mentioned top picks, we liked the tasty cherry cobbler from Bang Bang Pie shop and the delicate, layered, Dobos-Torte-like creation from Beacon Tavern. Of course M was particularly happy that there were 2 donut stations at Chicago Gourmet – Firecakes and Stan’s Donuts. The Loacker cookie company also was there with their signature waffle sandwich cookies, and Mariano’s peddled gelato (though it ran out pretty much right away). Chicago Gourmet is always a great place to try international spirits, and this year was no exception. Glenlivet and Glenmorangie whiskey tastings are always favorites, but there were a few more unusual choices this year, including Švyturys, the #1 beer in Lithuania. And of course, to stay cool, an Aperol Spritz was essential (see below). Though we have to say, one change that would be nice for future Chicago Gourmets is to have more non-alcoholic beverages – Bai drinks and Counter Culture Coffee provided a nice respite from the alcohol this year. There are also demos and master classes on the main Pritzker Pavilion Stage and tents on the lawn perimeter. We always try to attend one of these, and it is a great chance to see some great chefs in their element. This year we saw two iconic Chicago chefs – Stephanie Izard and Sarah Grueneberg – conduct a recipe demo of dumplings and pasta from scratch. Each created an Italian/Chinese fusion dish and they were each really funny and engaging in person. The demos, aside from being fun and informative, are also a good reason to get out of the sun. We stayed until the bitter end on Sunday, despite the punishing heat and sun. 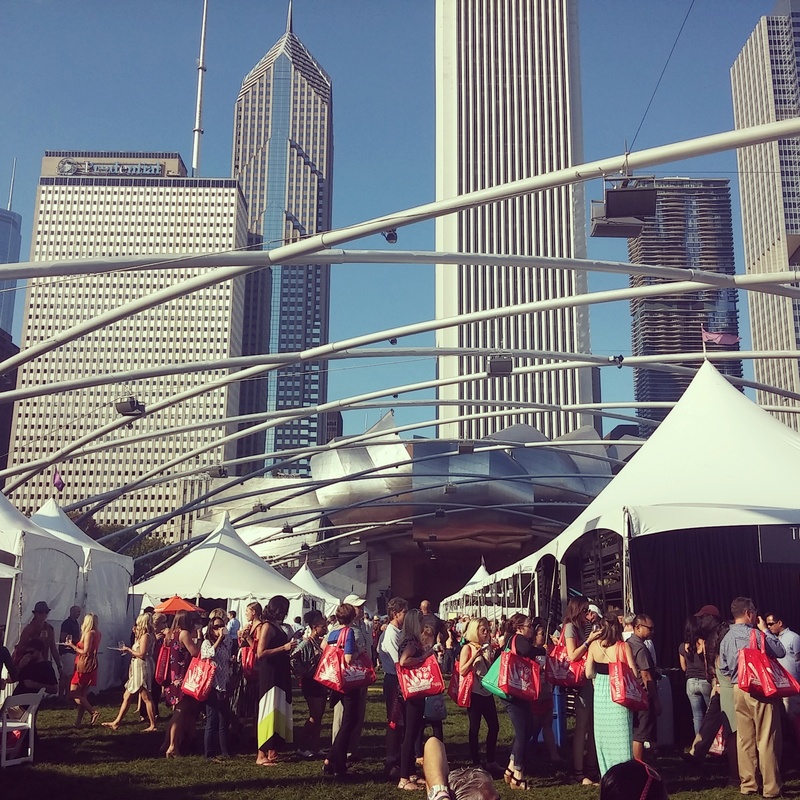 We are looking forward to another Chicago Gourmet next year (though we hope it will be a little cooler)! 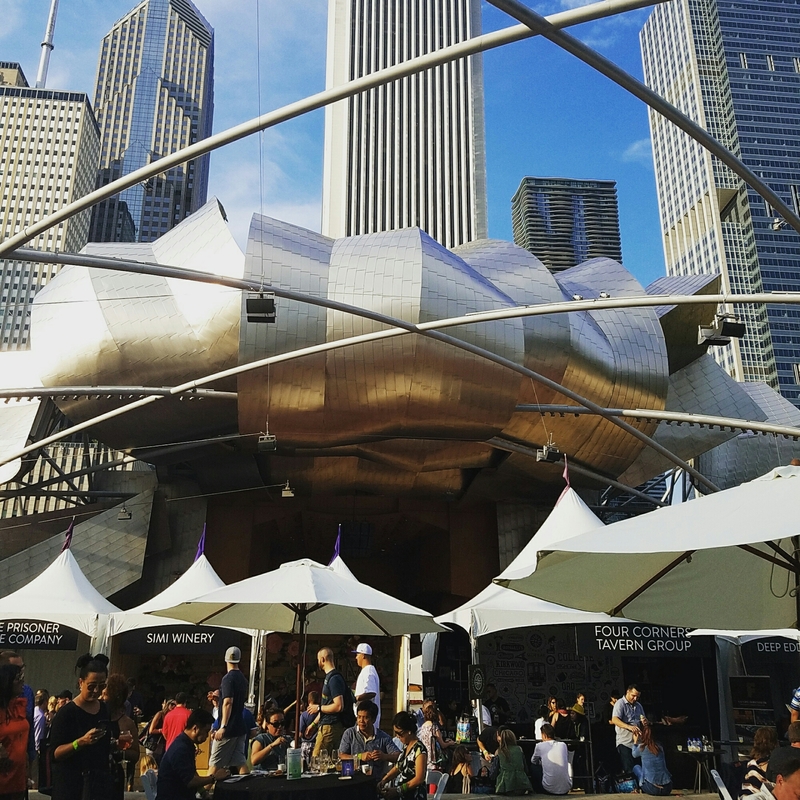 Chicago Gourmet 2016 was a great time – and a complete binge-fest! We estimate we sampled over 60 small dishes. It was hard to narrow it down, but we think we have arrived at our top 10 picks. Lobster Roll from Smack Shack (326 N Morgan St, Chicago, IL) – This was the best bite of the bunch, tons of tender lobster, fresh tarragon dressing and a perfectly toasted bun! Fig, blue cheese and honey vinaigrette from Nellcôte (833 W Randolph St, Chicago, IL ) This was the definition of one perfect bite. The fig and blue cheese combo seems so simple – but all the flavors blended together perfectly. Tuna Crudo from Ēma [top left] (74 W Illinois St., Chicago, IL) – A complex dish that was both beautiful and delicious, dressed with tumeric jus, microgreens and sungold tomatoes. Pineapple and Crab gazpacho from Hugo’s Frog Bar [bottom left] – A cold soup with super sweet snow crab – light and decadent at the same time. Prosciutto Butter Toast from Monteverde (1020 W Madison St, Chicago, IL) – Another deceptively simple dish, but executed to perfection – the whipped butter and prosciutto were super rich, but cut through by the crisp radishes. Pistachio chicken mole taco from Mezcalina (333 E Benton Pl #100, Chicago, IL) – this was the perfect combination of sweet and savory with the pistachio mole, topped with tender chicken and cotija cheese – a perfect tiny taco! The chapulín (grasshopper) topping was optional – but it added a nice crunch. Nori and shrimp ebi poke from Arami (1829 W Chicago Ave, Chicago, IL)- Salty nori combined with tender black tiger shrimp and sweet Maui onions to make the perfect briny bite. Hamburger Macaron from Cafe des Architectes (Sofitel Chicago Magnificent Mile, 20 E Chestnut St, Chicago, IL)- This was delicious – and fun – a macaron with chocolate filling, but shaped like a hamburger, complete with sesame seeds and candies in the shape of traditional toppings like cheese and lettuce. Taquito shrimp and black bean cones from Lula Bistro ( San Gabriel 3030, Jardines del Bosque, Guadalajara, Jal., Mexico) – The presentation of this dish was very cute, with the little crispy cones full of shrimp and black beans hanging from a tree. Fortunately, the taste was just as good. Chicago, IL) – This soup was not much to look at, but wowed with a sweet corn flavor, punched up with a chili kick. Which of these dishes sound best to you? 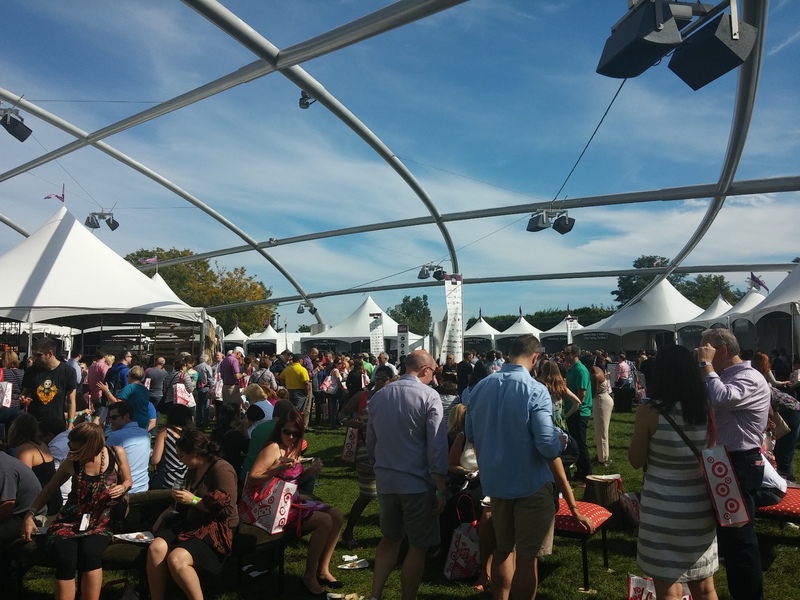 If you were at Chicago Gourmet did you have a favorite? One of the annual highlights of the Chicago food season is Chicago Gourmet! ETW is lucky to have gone for the last 3 years, and we always look forward to this veritable Disneyland of food. You pay a flat fee to enter and then the food and booze are free-flowing throughout the day in the enclosed event space in the Pritzker Pavilion in Millennium Park. The theme of this year’s Chicago Gourmet was “Food is Art,” and there were sculptures throughout, including a giant waffle, which seemed to be a fan favorite (by sculptor Christopher Newman). Otherwise, the setup in 2016 was similar to that of years past: the wine distributors are in two rows the middle flanked by themed tasting booths, restaurants, and other exhibitors on the perimeter of the park. Each of the themed booths had two sessions, with 3 or 4 different restaurants appearing in each 2-hour block. 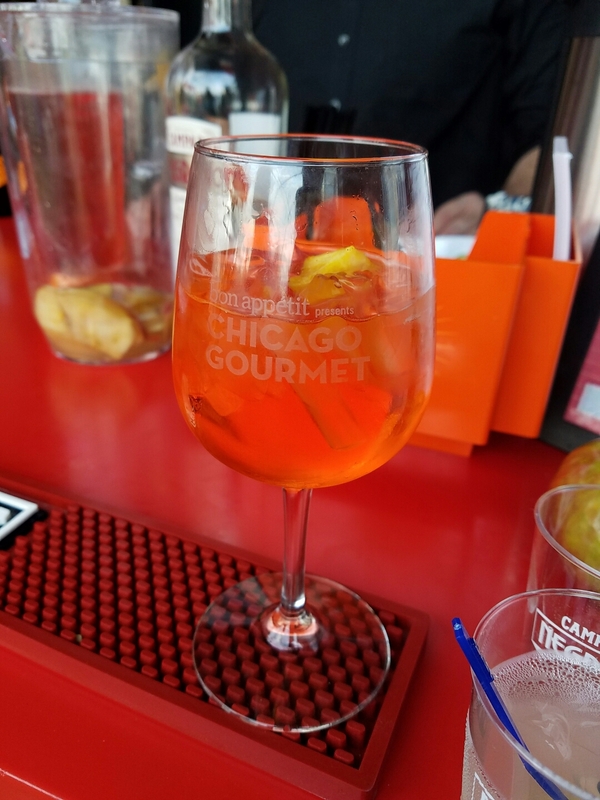 One of the tips we learned from last year’s Chicago Gourmet was that you can’t possibly hit everything – or even most things- especially when it comes to the booze! We focused on going for international foods this year, as in years past, as well as seafood, which always seems to be a safe bet. The main place for international flair at this year’s Chicago Gourmet was the Chicago sister cities tent, featuring Chicago restaurants with cuisine from one of Chicago’s 28 sister cities. First up (above) was Kamehachi (representing Osaka) with tuna tataki tartare on a crispy sticky rice cake; Avli Estiatorio (Athens) with pork tenderloin over apple skordalia with a walnut dressing; an Indian/Latin spiced rib from Vermilion (Delhi); and an unexpectedly sweet egg bao from Imperial Lamian (Shenyang, China). In the second round (below) we were treated to a Nori and shrimp ebi poke from Arami (Osaka); charbroiled octopus on pesto from Filini (Milan); corned beef from the Canadian-themed Northern Lights Poutine (Toronto); and a refreshing mango and shrimp salad from Cochon Volant (Paris). One of the standalone booths with an international flavor was the Peruvian favorite Tanta, which offered burrata quinoa caprese-style salad and dulce de leche-filled alfajores. One of the other standout bites came from the American Express booth: butter and prosciutto toast topped with crispy radish from rising star Monteverde, with chef Sarah Grueneberg herself at the helm (below). We also sampled some of the Korean condiment Gochujang, and we have a hunch it will be the next Sriracha sauce. Some “big name” brands were there, too, including the Shop House Southeast Asian concept from Chipotle, Barilla, and Thermador kitchen appliances – which had a rotating dessert menu (including a giant platter of Stan’s Donuts) which turned over every hour or so! One of the most consistent (and crowded booths) was the seafood tent, so we made a beeline for there after each turnover. Some of our favorite dishes from the first round were found at the seafood station, Hugo’s Frog Bar’s pineapple and seafood gazpacho and Ēma’s elegant tuna crudo. In the second round we had our favorite dish of the entire event, a tiny lobster roll from Smack Shack that was absolutely full of prime lobster, in a tasty dressing with fresh tarragon, on a toasted bun (below). We could have gone back for two or three more. Creativity was also key at some of the booths. We loved Cafe des Architectes’ “burger” macarons – which were styled to look like sliders, complete with “bread” shells, and a chocolate filling. On the unique display front, Promontory had a little brick sterno grill with octopus and veggie kebabs in the Mariano’s tent. This location provided some of our other favorite bites, Dusek’s corn cream soup with chili oil; Nellcôte’s fig and blue cheese; and broccoli with nigella seeds from Ada St. On the BBQ front, there were assorted BBQ bites at the Big Green Egg tent, or at the more secluded second tent, which used to house the Sister Cities. One of the solid bites from this area was the ever-reliable brisket from Smoque. Overall, there were a lot of tasty desserts at Chicago Gourmet, maybe more than in previous years. Mariano’s had an entire gelato booth where you could get a scoop of their classics, like chocolate, stracciatella, pistachio, and even the more unusual Speculoos. There was also an Gelato World Tour voting tent (above) where competitors (including Gelato D’Oro, Volare, BomboBar and Coda di Volpe) vied for the top spot with their more unusual gelato flavors. Our favorites were the chocolate cardamom, “Breakfast at Nonna’s House” (red currant, fior di latte and granola) and pink peppercorn. The Macau tourism tent also has an interesting dessert offering from Fat Rice: a sweet/savory, nori rice krispie with pork floss, sesame seeds and caramel fish sauce. The Mexico tent was unusual in that it offered bites from both Mexican restaurants in Chicago, and some that are actually located in Mexico. The first round had a savory brisket taco from El Solazo; creatively-presented taquito shrimp and black bean cones from Lula Bistro in Mexico; and splashy yellow and green tequila macarons from La Postreria in Guadalajara. Round two (below) were chicken taco with crema and and chapulines (grasshoppers) from Mezcalina, white chocolate “Angel” mole from New Rebozo and a beef, mango and cotija tostada from Bar Takito. We are not wine experts, so frankly we feel that we are always a little behind when it comes to the wine potion of the fest. We hit up the Campari booth for a refreshing Aperol Spritz, and tried a number of wines from around the world. There were also a few unique nonalcoholic drinks including a turmeric chai from Rishi tea and the new-to-us Lemoncocco drink, based on lemon and coconut spritzers found at the Lemoncocco kiosk in Rome. We also got the requisite Stella Artois beer glasses, and attempted to savor some Glenmorangie and Glenlivet. Another drink hit was Punch House’s berry punch with basil, located in one of the main tents. This year’s Chicago Gourmet was a real success, and left us satiated with flavors from near and far. As always, we capped off our day with one final mini-cappuccino from Illy. Chicago Gourmet also signals the unofficial end of the summer – and we think we sent it off in style. We look forward to seeing you at Chicago Gourmet next year! After having attended the Chicago Gourmet food and wine festival for several years, I’ve picked up a few strategies for making it through the day with the maximum amount of food and fun. So how do you successfully navigate the gamut of unlimited food and free-flowing booze and plan the optimal experience? Where else but Chicago Gourmet can you attend a BBQ demo while sipping on Chilean wine and munching tiny lobster rolls? This always-anticipated food and wine event, spanning a weekend in September, is a veritable culinary wonderland. This is my third year attending, and despite the crowds, I still think it is one of my favorite, (and most gluttonous) annual experiences. Chicago Gourmet takes place inside the Pritzker Pavilion in Millennium Park in downtown Chicago. The main stage hosts talks and demos by big-name chefs, while the perimeter is ringed with tasting tents where 3 or 4 Chicago-area chefs serve small bites or drinks from their restaurants. Smaller tents scattered around the pavilion host other food and beverage exhibitors, chef demos and beer and wine tastings. Another wildly popular part of the festival (the MOST popular part of the festival?) are the two rows of wine and spirits exhibitors in the center of the great lawn (below). ETW was thrilled this year to receive a complimentary press pass to Chicago Gourmet, a 2-day festival and showcase of the best food and wine the city has to offer. The star-studded event offers an opportunity to catch a glimpse of the latest trends in the Chicago food scene; and in 2014, five years after my last visit, I remained very excited to see the changes (as well as, of course, the old classics). General admission tickets for a single day are a steep – $170 for a day or $275 for the weekend – but offset by the knowledge that tickets include all the food and wine you can drink/stuff yourself with. You can buy a ticket for Saturday or Sunday (or both) and these sold out in advance of the event. I recently heard the event compared by Gapers Block to the Lollapalooza of food, and that may not be too inaccurate. Set inside the Pritzker Pavilion lawn in Millennium Park, in downtown Chicago, and gated off, the price and security reinforce what an exclusive event this is. On entry, you get a reusable tote, and everyone gets a wine glass and a plastic plate with a little wine holder to take to all the various booths. Camera in tow and plate in hand, I headed into the fray to see the best and brightest of Chicago’s culinary landscape. Exhibitor and chef pavilions ring the central lawn, in addition to a further aisle of pavilions in the center of the field. Buckets of water bottles, tables and chairs were dotted throughout the lawn. Though people trickled in slowly at first, soon there was a mad rush of people pouring in, with lines forming quickly at most booths. Avoiding the mad booth rush, I started off at the Pritzker Pavilion, where the day’s first cooking demo featured Carlos Gaytan and Rick Bayless cooking some of their Mexican favorites and chatting amiably with the crowd. Nearby, on the east side of the park, there were further hands-on seminars (such as Bordeaux wines and another on fried chicken). Another popular demo centered on chef Carla Hall’s favorite comfort food. Demos aside, the bulk of Chicago Gourmet’s food offerings are available at ten different themed dining pavilions.There were two rounds at each pavilion, 12:30 to 3 and 3-5:30, each with a wholly new set of restaurants/chefs. Each pavilion had 3 or 4 tables inside and theme park-style switchbacks to direct the line, even though these frequently spilled over. There were some pavilions with obvious themes, including dessert or BBQ, while others had a broader flavor like the Mariano’s or Green City Market pavilions. Before the pavilions even opened, some already had lines, and at peak time some lines were 30+ minutes long. Once you reached the front you received a tasting portion from each chef, often in a biodegradable coconut husk plate. You also had the opportunity to chat with the chef, but not too much, lest you irritate the people in line behind you. Trying every single dish would be near impossible, and some of the portions are not super tiny so I had to make the effort to prioritize. It’s a little overwhelming! Some surprising aspects of the festival were both the amount of non-food offerings (maybe we need to learn to enjoy wine a bit more? ), as well as larger well-known companies including Vosges, Barilla, and somewhat peculiarly (sorry) Chipotle offering tastings. The balsamic truffles and bacon chocolate from Vosges were a particular highlight from this group. Other food purveyors outside of the pavilion areas included Gaylord Indian cuisines, who provided some tasty chicken tikka masala, Texas de Brazil with signature churrasco and Chicago Q, which presented a tasty brisket slider (and a pretty impressive sauce and smoker setup). Various vineyards and liquor distilleries were also featured, and sampling was highly encouraged (some people definitely over-imbibed). I tried to stick to some of the more unique options, and highlights included a pink champagne cocktail from Chandon, and pisco sour from Kappa. Those whiskey lovers among us would have appreciated the Glenmorangie booth. I would be quite curious to see what a wine lover would pick from the Chicago Gourmet lineup (or how they would even begin to navigate the huge number of booths). One of the ETW favorites was, perhaps unsurprisingly, the global pavilion. Restaurants serving food from Chicago’s sister cities were featured, which I think was particularly clever. The lineup was slightly different on each day, and also included food importers, a book signing area and a small market of foods, drinks and spices produced by local artisans. On the day I visited, the following restaurants and sister cities were represented. Belgian brewers Leffe and Stella Artois provided some international beverages for the tent. It even seemed to be a badge of honor to get the official Stella glassware that came along with a cider or beer tasting. Even right when the door opened there was a huge line for Stella. I did not even attempt to enter the Stella beer line, though I did sample the cider (above -which was quite good, even from a non-beer drinker’s perspective). At 2 pm I made my way over to the Grand Cru event on top of Harris Theater, which was a separate $199 ticket on top of daily admission. The setup was similar to Chicago Gourmet, but compressed. The entire event was located in a tent with chef tables in the back, with aisles of wine and spirits hand-selected by Master Sommeliers. Due to the confined space, I fount this tent to be extremely claustrophobic, and some elbows were definitely being thrown to get to the wine samples! Making my way through the wine gauntlet, I headed for the chef tables in the back. Girl & the Goat chef Stephanie Izard was serving goat empanadas with heirloom tomatoes, and was the biggest crowd draw of the event. She entertained everyone’s questions gracefully, which may have contributed to the length of the line. But she is so nice, who can object? That’s not to forget the other star chefs in attendance at Grand Cru: Jamie Bisonette (Coppa, Boston), Jimmy Banos Jr. (Purple Pig), Andrew Zimmerman (Sepia), Bruce Sherman (North Pond) Justin Aprahamian (Sanford, Milwaukee), Tony Mantuano and Chris Marchino (Spiaggia). Zimmerman’s eggplant tortoloni with cashew and sesame in broth was my favorite bite of Grand Cru tables. As another point of difference, the water in Grand Cru was upped from Ice Mountain to Acqua Panna (for some reason this struck me as funny- it’s water!) and the vintners were even pricier than at the main event. Grand Cru also hosted several Master Sommeliers, including Alpana Singh, to teach classes. While I enjoyed my trip into the refined Grand Cru, there wasn’t much seating to be had on the roof, so I sauntered back to the main event instead of lingering for long. By 4:30 the crowd was beginning to thin out, and I decided to get a mini Illy cappuccino to get a final shot of caffeine. As the day was wrapping up, some of the pavilions were giving away their food, instead of throwing it away. So if you can really hold off while the lines are long chances are you may get to sample all the food anyway. I had a great time and really stuffed myself at Chicago Gourmet. It was a great chance to sample some foods and restaurants I had never tried before, and gave me a few recipe ideas. It is definitely a must for every Chicago food lover at least once. Chicago Gourmet Recap Coming Soon! This wekeend L had the good fortune to attend Chicago Gourmet and cover it for Eating the World. Stay tuned for the recap with in the next few days. There will be a lot of pictures! My cousin called me on Friday, as I was en route to Madison, and asked me if I wanted to attend Chicago Gourmet on Saturday. For free. His wife had gotten tickets through work and was kind enough to offer the extra pair to M and Me. So did I want to a Chicago-centric, upscale food and wine expo? Did I ever. Unfortunately M could not come with back to Chicago due to impending work deadlines. Now I felt quite guilty about abandoning M up there in Madison with his deadlines. But I had to take the opportunity. [Note to M: I’m sorry M, it wasn’t all that good you can stop reading now]. The event itself took place in Millennium Park right in the Chicago loop under the Frank Gehry-designed Pritzker Pavilion, where concerts and other goings-on usually occur. The setup itself was reminiscent of the Taste of Chicago (and most every food fest, I suppose), on the perimeter of the fenced-off area were the food pavilions and towards the center were wine and spirits booths. Scattered throughout were an assortment of seating areas where people could stop and nosh. Inside each tent, or should I say, “Gourmet Pavilion,” there were several restaurants, grouped by theme, each offering tasting portions. Interestingly, the head chefs/owners themselves were often manning the tables, alongside a small staff. Check out Graham Elliot Bowles manning the Graham Elliot booth with a small army’s supply of sweet corn panna cotta. There were 2 rounds of food, one from 11-2:30 and one from 3-6. The gourmet tents were arranged into themes, along the lines of Regional American, Asian, Latin American and dessert, with a different set of restaurants in each time slot. On Sunday, the offerings flipped to French, Mediterranean and Gastropub. Most of the restaurants gave out very generous potions, which was surprising, but welcome. Though this generosity did indeed present a little bit of a pacing problem, I think we did a pretty good job of spreading out our tastings over a 7 hour period (breakfast, lunch, dinner and then some). At the tents themselves, the turnover was very high, though the length of the lines waxed and waned throughout the day. We did not encounter any places that ran out of food, save for Frontera Grill (no surprise, I guess) and places we tried to visit after about 5 PM. A complaint at last year’s Chicago Gourmet was that there was not enough food (as compared to a seemingly endless wine supply), so I think this year they managed to have a much better supply. Above, at Le Colonial’s, tent there was more than enough Bo Bi, vegetarian spring rolls filled with carrots and jicama, to go around. Note the plum and peanut sauces. My favorite dish of the day, and my cousins and their friend M agreed, was from the Four Seasons at the regional American tent. It consisted of BBQ pork belly, with a cilantro and corn relish on a homemade buttermilk biscuit. I got there towards the end of the serving time, meaning that I only got one half of a biscuit – but it was well worth it in any case. The pork belly was deliciously crispy and the corn salsa had a citrus-y tang that offset the rich and flaky biscuit. One of the more complex Asian dishes was put out by Sola, a sesame Tuna Tartare. I encountered a few new ingredients in this dish: hijiki and Wasabi tobiko. Hijiki, the brown flakes, are actually a brown sea vegetable (apparently also dangerously full of arsenic…oops). The tartare had a wasabi kick, as well as a topping of wasabi-infused caviar. And of course I was a sucker for the lotus chip. The Latin American food tent did not disappoint in terms of showmanship. Yes that’s right, here’s a full pig on a grill at Catalan tapas restaurant Mercat a la Planxa’s booth. This was the first dish I tried all day. The pulled pork was absolutely perfect ( it stood up to my new found pulled pork snobbishness that resulted from my Southern roadtrip), and came served on cannellini beans with asparagus. We saw the pulled pork theme repeated at a few other stands, but Mercat’s rendition blew them all away. I guess it was probably the freshest, but that’s just a hunch. Of the desserts presented, my personal favorite was the lavender Terry’s Toffee though it was a mean tossup. Japonais’ elegant green tea tart with handmade marshmallows and candied ginger certainly won the prize for the most attractive dessert, though Francesca’s Tiramisu wins for the most generous portions. The same goes for Fannie May, who was serving full wedges of decent cheesecake based on their signature chocolates (though it had frosting – who puts frosting on cheesecake?). Scattered throughout the area were also wine and spirits vendors. Actually, probably about 1/2 of the presenters total were actually vineyards. There were many well known names like Absolut and Mondavi, but also lesser known craft brands and family-owned wineries. Part of the admission fee was one free wine glass, which you then took around to use for tastings. I thought that was a nice green touch, especially after we saw the trash can bursting over with discarded plates and forks from every tasting. I think to truly get the most bang for your buck out of Chicago gourmet you have to be a wine and spirits connoisseur. Not to say it isn’t worth it otherwise, but it is definitely MORE worth it if you have a taste for wine. As with the Taste of Chicago there were some disjointed random “Freebie” booths scattering throughout like those advertising cars (I forget which one) and also a booth from the Cayman Islands (for your beaches and offshore banking needs). But also, in a Chicago Gourmet turn of randomness there was a roving band of servers from the catering company 5411 Empanadas passing out free empanadas. Featured above is a cheese and Spinach empanada along with the tasting portion of pumpkin seed chicken salad from Stephanie Izard’s future restaurant, Drunken Goat. Also as a ‘gourmet’ step up from Chicago tap water, there were barrels of free Evian bottles. Though mini bottles of posh water were nice, the non-restaurant stands that had my heart were the Illy Espresso carts and the Pastoral cheese booth. Throughout the day there were 2 stages of cooking demonstrations. We saw haute-Thai restaurateur Arun Sampanthavivat’s cooking demo, but it was too bad the Viking cookware kept acting up! The other venue for the cooking demos was on the stage of the Pritzger pavilion itself, but unusually, the chefs did not face the audience – they faced backwards into the choir loft, where a relatively small crowd of 75 or so got to watch. I thought this was a bit odd, since many of the chefs: Rick Bayless, Mindy Segal, etc. could have probably drawn quite large crowds. Another feature of the Gourmet Festival was a book signing of celebrity chef cookbooks. You could buy the books right there for a markup, but most people, including myself, came prepared with their own cookbooks. At the signing session I attended there were three chefs: Rick Tramanto, Marcus Samuelsson and Rick Bayless. I was the only person in line for Marcus Samuelsson, there were about a dozen for Rick Tramanto, and hundreds, and I mean hundreds, for Rick Bayless. The line snaked all the way around the entire tent area! I mean, I love Rick Bayless as much as the next, but I must admit, it was kind of awkward. But anyway, while I was waiting to have Marcus to sign my book, I got a nice shot of the both of them. Chicago Gourmet was an amazing experience. For a whole day we got to sample food from the best chefs in Chicago (in unlimited quantities) and generally just have a good time. Though I did not attend last year, I’d definitely say that the set up this second year was excellent, and that there was plenty of food to fill us to point of bursting. I was glad to have the opportunity to sample a wide range of restaurants that, owing to shortages of time and money, I will probably not be back to for a while. Many thanks to my cousins for thinking of M and me. Though, all things considered, it’ll be a bit of letdown going to the Taste of Chicago from now on….